Can you believe it's May already? 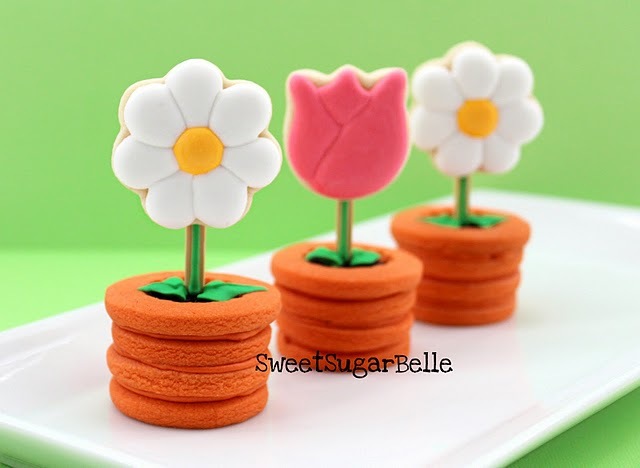 That means one thing in my book - Mother's Day is just around the corner! 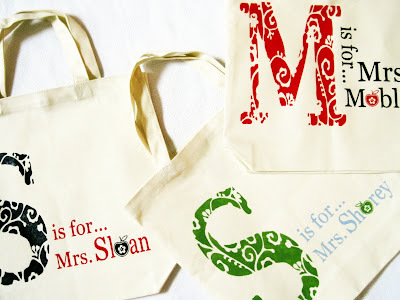 Lately, I'm drooling over all things monogrammed, so here's my list of ten great personalized presents any mom is sure to love! Double Duty Bag I'm Loving: If there are two types of bags I adore, they're clutches and cross-bodies and this sassy number from Tiny Tulip can be either. 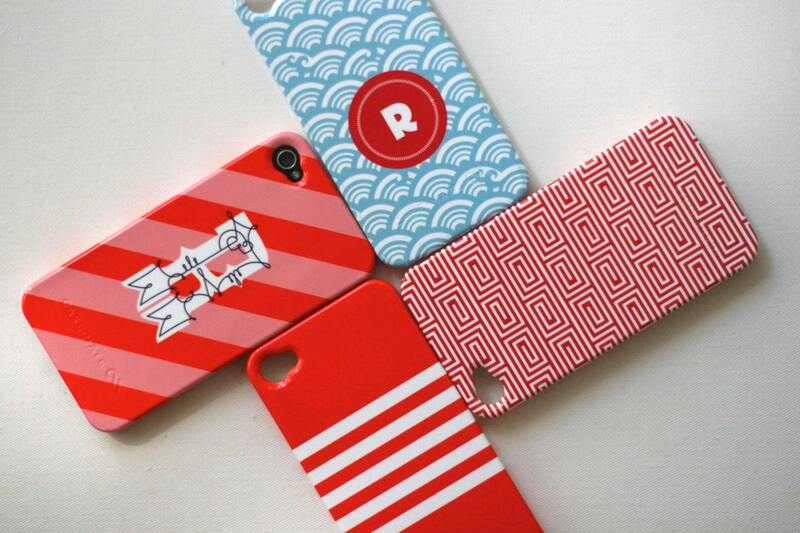 Pair the versatility with the bright, bold color options, and I'll take one of each! Cute Cuff I'm Loving: The Enamel Initial cuffs from C. Wonder are simple and elegant, and I love the idea of wearing a set of them with each of your family member's initials. 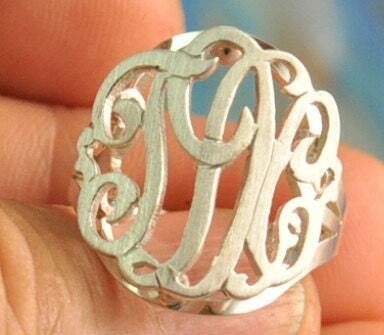 Initial Ring I'm Loving: This sterling silver monogram ring from Kraftshop has a beautiful vintage feel to it. Wrap I'm Loving: I don't know about you, but I live in pashminas. 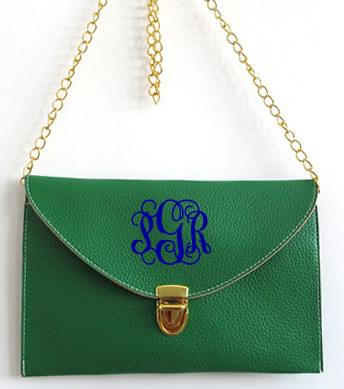 They're the perfect accessory in my book, and this monogrammed version from Marley Lilly gives a fun twist to an old favorite. Tote-ally Awesome Bag I'm Loving, Part 1: Longchamp's bags are an investment but they'll go with everything and last forever. 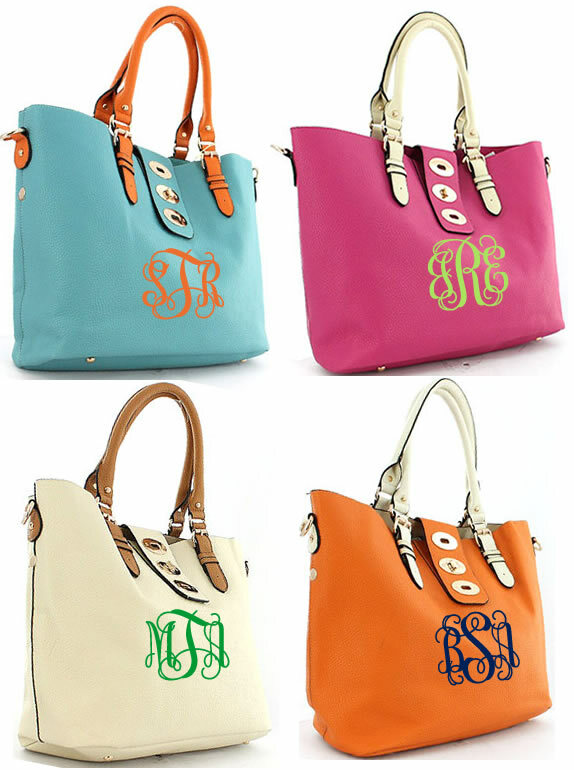 And the new personalized Le Cabas style has me head over heels - you pick the shape, size, leather color, lining and monogram to make a bag that's as one-of-a-kind as you are! Tote-ally Awesome Bag I'm Loving, Part 2: Want something a little easier on the wallet than the Longchamp? The Buckle Tote from Tiny Tulip should fit the bill. 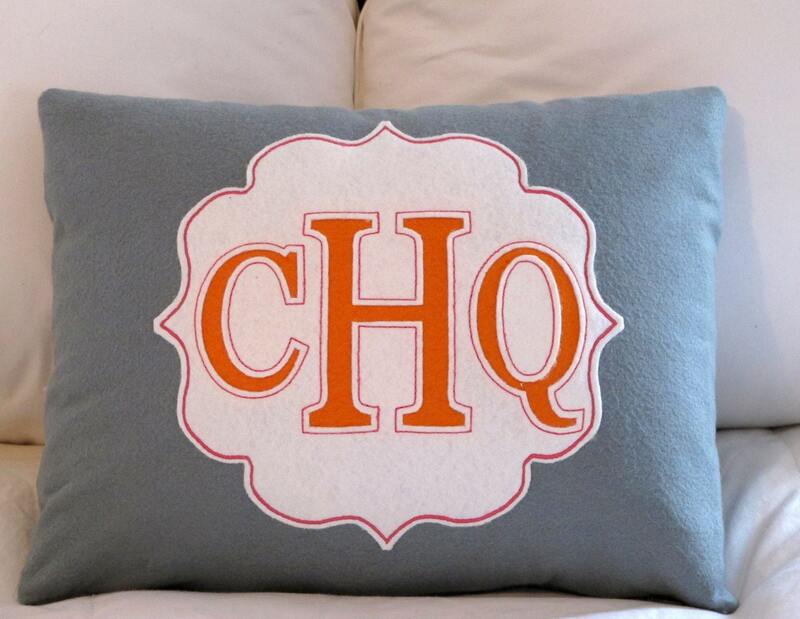 Adorable Accessory I'm Loving: This monogrammed pillow from Studio Design Lab is a pretty way to help personalize her space. Necklace I'm Loving: The Acrylic Block Monogram Necklaces from Moon and Lola are super mod and come in tons of fab colors. I think I want one in kelly green. Gadget Gear I'm Loving: There are tons of great iPhone and iPad covers available out there but I love the modern feel of the ones from Pencil Shavings Studio. 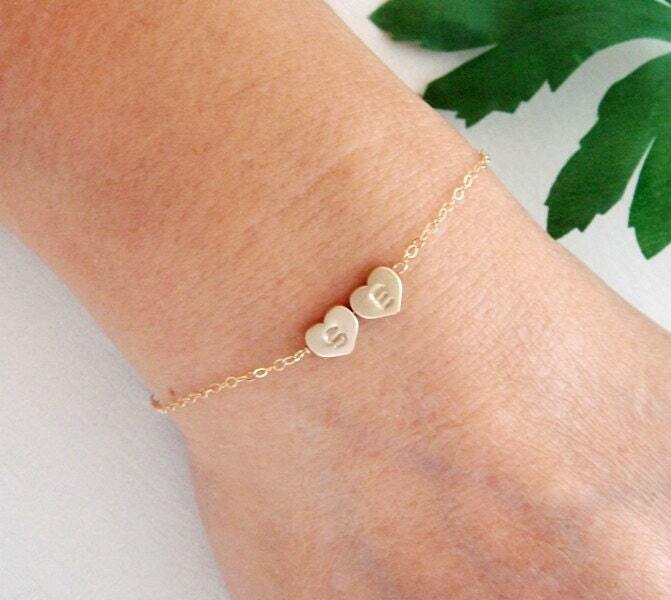 Sweet Bracelet I'm Loving: The dainty Initial Heart Charm bracelet from Hot Mix Cold is perfect to wear every day. 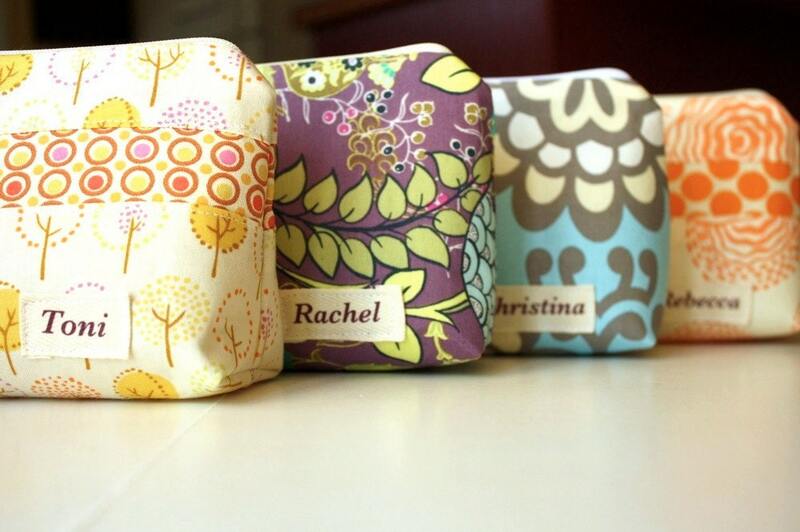 Bag to Go in a Bag I'm Loving: I'm of the belief you can never have too many fun little pouches and these personalized pretties from JuJu Baju are just perfect. So there you have some of my favorite monogrammed gift ideas for Mother's Day. See something you like? Just leave your browser open with this post up and hope your hubby happens to notice.... And to check out more of my must-haves, visit my Mama's Wish List Pinterest Board. I'd love to hear about the things you're loving right now! Share the app, movie, book, craft idea, TV show, whatever that's got you giddy in the comments and your picks might be included in next week's TEN ON TUESDAY feature. 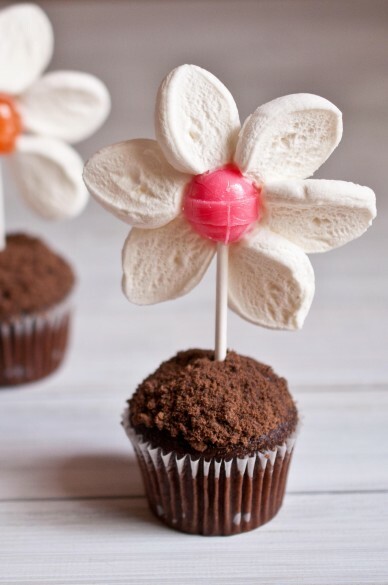 And for more of my favorite things, check out my Pinterest boards! Today's post is a little different than our typical FUNDAY MONDAY giveaways but there are lots of great prizes to be won nonetheless! This is my friend Angela. And my contribution is this fun Lee Angel Bracelet and jewelry roll from Ann Taylor Loft. But that's not all! 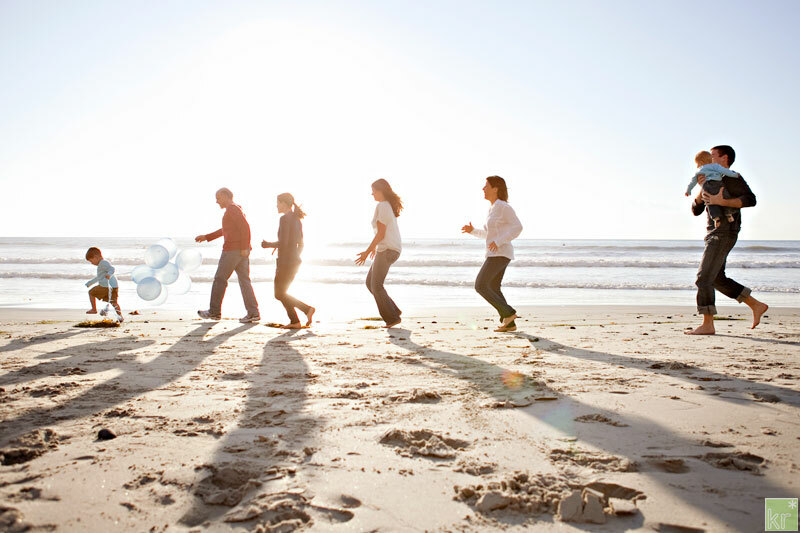 If you happen to live in Southern California, Katy Reigner Photography has donated a portrait session plus your five favorite images on DVD. 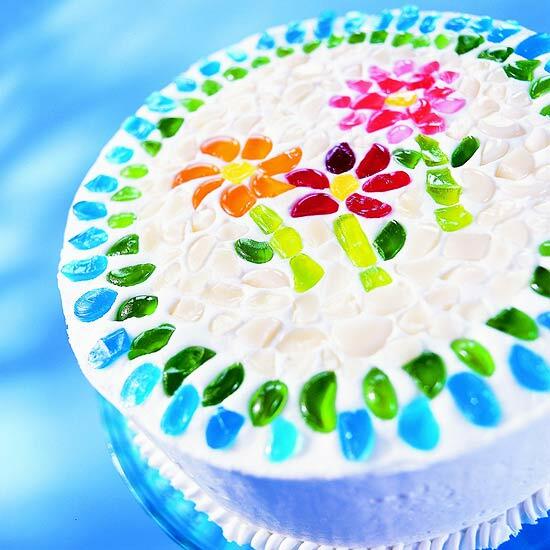 Just look at how beautiful her work is! 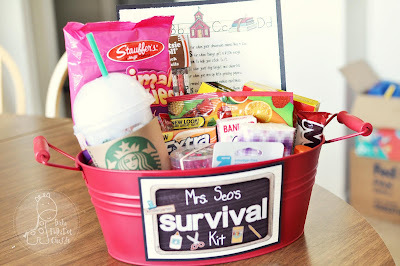 Plus, you can also win gift certificates from Old Navy, Victoria's Secret, Amazon, Starbucks, Pottery Barn Kids and more! Entering is easy. Donate a $1 and you earn one comment to leave on the prize of your choice, which will be your entry. Donate $10 and you get 20 comments, so you can leave one each of on 20 different prizes or all of them on one prize to increase your chances. And if you donate $20, you get 40 comments. Simple, right? The raffle closes this Thursday, May 3rd at 7:00 pm EST so head on over to MoMs For a Cure, make your donation and get to entering! You might just score an early Mother's Day gift for yourself, while helping make a difference in the fight against breast cancer. It's FREEBIE FRIDAY and with just one more week left in Teacher Appreciation Month, today's featured printables will help you come up with something cute for the educators in your child's life. Up first, just attach this sweet printable I saw over on Skip to My Lou to a store-bought note pad and voila - instant adorableness! Or fill a berry basket (Hello recycling! 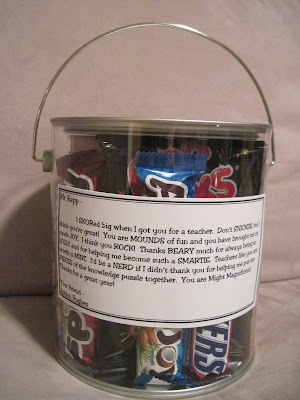 Teacher's Appreciation + Earth Day all in one post!) 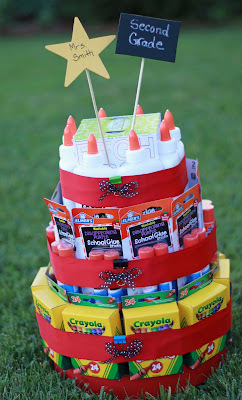 with some fruit-scented goodies and add this tag from The Girls at Eighteen25 for a super cute gift. Hope you enjoyed today's pick! 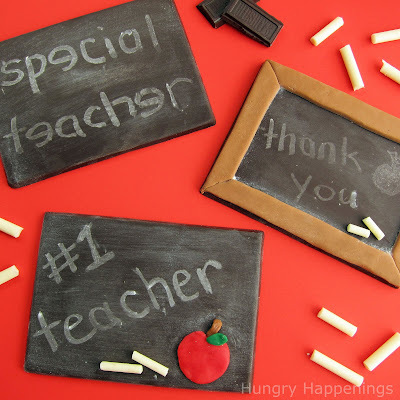 I've got more Teacher's Appreciation Day ideas here and for more fab freebies, check out my Freebies and Printables boards on Pinterest! It's a balmy and beautiful 80 degrees in Rhode Island today and that gets me in the mood to eat out on our deck. But nothing too heavy... I think I'm in the mood for a nice, hearty salad. Yes, you read that right, and here are ten drool-worthy recipes I'll definitely be trying out this summer. 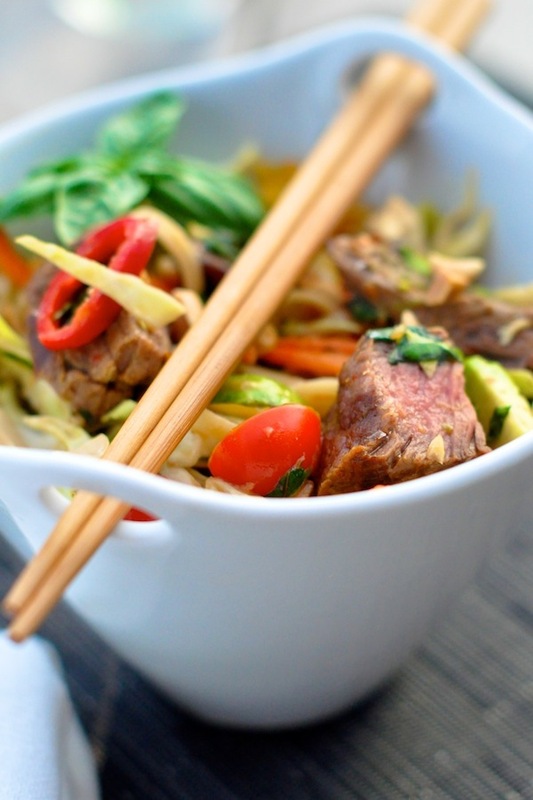 Meaty Salad I'm Loving: Just the picture for this Thai Steak and Noodle dish from Camille Styles makes my mouth water! Pretty Salad I'm Loving: Display a Classic Cobb in all of its rainbow glory like Babble.com shows here and you've got a pretty and tasty way to serve a crowd. 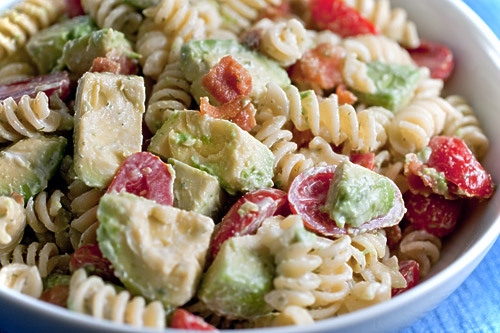 Avocado Salad I'm Loving, Part 1: Life's Ambrosia puts a pasta salad spin on a BLTA (that's bacon, lettuce tomato and avocado sandwich) that looks delish. 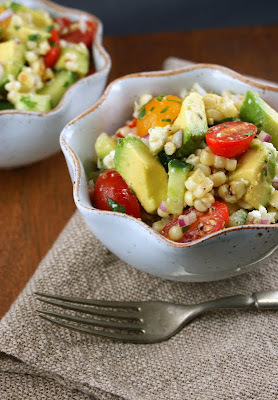 Avocado Salad I'm Loving, Part 2: It doest get much simpler than this Avocado and Grilled Corn Salad with Cilantro Vinaigrette from Authentic Suburban Gourmet. 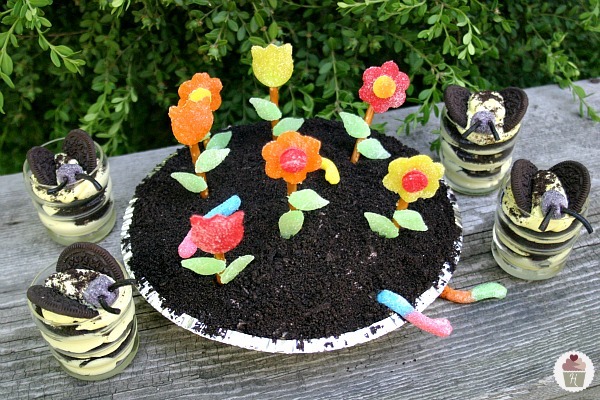 Layered Salad I'm Loving: Looking for a simple but impressive dish to bring to BBQ's and parties? 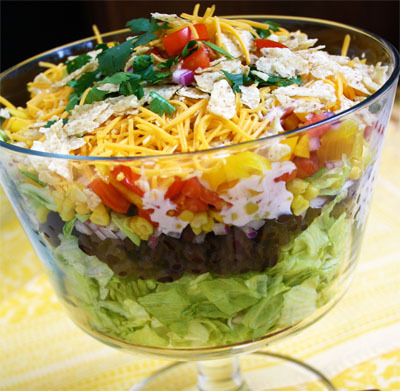 This Southwestern Layered Salad from Skip to My Lou will do the trick! Salad That Will Impress Your Friends I'm Loving: Who wouldn't be wowed by this Melon and Peach Salad with Prosciutto and Mozzarella from My Recipes? Tastes Like Greece Salad I'm Loving: I would eat this Mediterranean Orzo Salad from Centsational Girl every day if I could. It's THAT good. BLT in Salad Form I'm Loving: A Bird and a Bean is brilliant because BLT + pasta = heaven in my book. 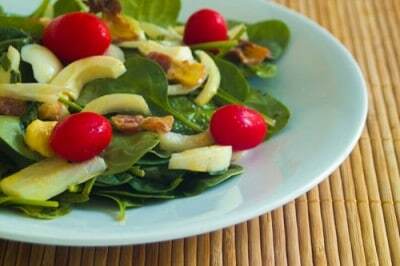 Warm Salad I'm Loving: I usually don't equate warm with salads but this heated spinach number from Eclectic Recipes sounds divine. Fruity Fishy Salad I'm Loving: I don't know that I would have thought to put raspberries with scallops but this sassy salad recipe from The Family Kitchen makes me want to ASAP! Salad Even a Man Will Love I'm Loving: If your husband is anything like mine, he doesn't consider a salad a meal. Maybe this Buffalo Chicken version from The Family Kitchen will change his mind. So there you have some of my must-make salads for summer. 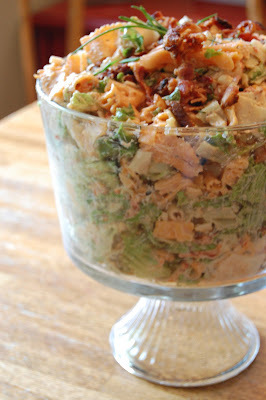 For more fun recipe ideas, visit my Scrumptious Salads Pinterest Board. Last Thursday night, my mother asked me to take her to an event a friend of hers had planned featuring a night out with author Adriana Trigiani. I hadn't read any of her books but my mother LOVES them so I figured it couldn't be that bad, right? To my surprise it wasn't bad at all - it was freaking hysterical! Adriana didn't do a typical reading from her new novel, like most authors do on a book tour. Instead, she spent the time - which flew by - telling hilarious anecdotes from her life, mostly focused on growing up in her big, Italian family. A few times, I laughed so hard, tears came to my eyes. It was THAT good of a time. 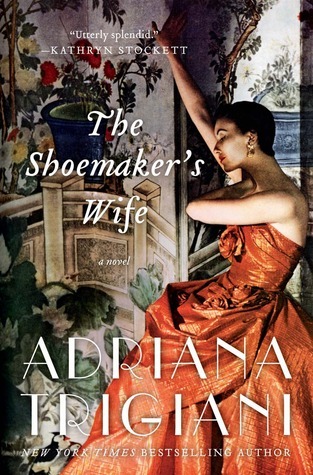 So now I'm reading Adriana's latest book, The Shoemaker's Wife, and I cannot put it down. It was inspired by her grandparents, Lucia and Carlo, and highlights the immigrant experience in America at the turn of the century. If you're a sucker for historical fiction like I am, you'll love this book! And if you get a chance, be sure to check out Adriana Trigiani when she makes a stop in a town near you (find all of her upcoming tour dates here). Trust me, it's an experience you won't soon forget! And I've got good news because not only do I have a copy of The Shoemaker's Wife to give away to a lucky AFOMFT reader but it's also autographed by the author! 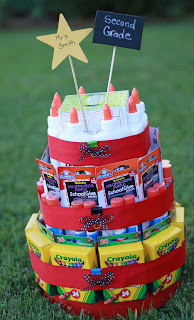 Please leave a separate comment for each entry (two if you've blogged about the giveaway) and make sure to include a link to your tweet, blog post, etc. All entries must be posted on AFOMFT as a direct comment to this post. Comments on Facebook will not count as entries. This giveaway is open to residents of the U.S. only and ends April 23rd at 11:59 pm EST. The winner will be selected by random.org and announced on AFOMFT on April 24th. If the winner does not contact AFOMFT within 48 hours, a new drawing will be held so be sure to check back to see if you've won! And if you haven't already, don't forget to enter to win the perfect spring necklace right here - the giveaway closes tonight! 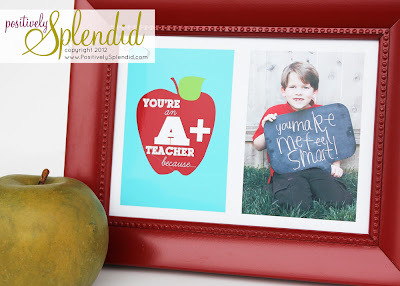 It's FREEBIE FRIDAY and today's featured printable comes from Jenna at Q.A. Design. I've been trying to come up with something fun to do with a wall in the girls' playroom and when I saw her downloadable state and country art prints, I knew I'd hit the jackpot. Aren't they fabulous? I love the color combinations - just popping them in a simple white frame will make a huge impact - and with 65 different options to choose from, there are so many ways you could group them - states you've visited, the countries your family is from.... the sky's the limit! 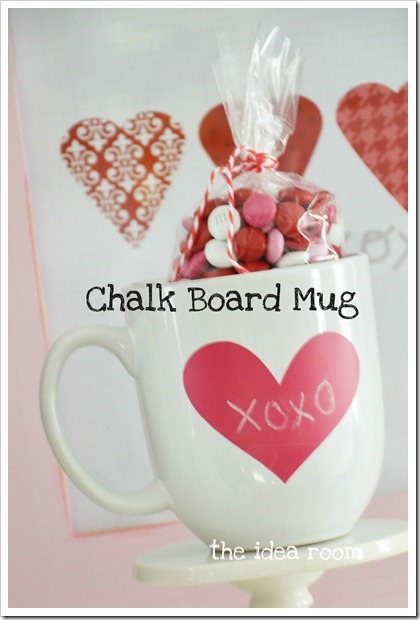 Hope you enjoyed today's pick and for more fab freebies for the holiday and beyond, check out my Freebies and Printables boards on Pinterest! I've gotten a few e-mails asking what the "real" job I often reference is so for ANYTHING GOES THURSDAY, here's a little peek at what I'm up to when I'm not blogging here. I co-own a production company called MAD FUSION which specializes in producing content for television and the Internet. So when I go MIA from AFOMFT for a bit, it's probably because I'm off somewhere producing something new for Mad Fusion. I'm trying to find the balance between doing both but I'm learning that running your own business sometimes means putting everything else on the back burner. I promise not to let it happen too often, though! If you'd like to keep up with what we have coming down the pipeline at Mad Fusion, you can follow us on Facebook or Twitter, and for more of the Mom Shopping Network, visit NickMom!